Oh, just around the corner. Well crap. It snuck up on me. I have been so buy with work lately that I haven’t had a crafty moment to spare. A major deadline passes at the end of this week, and I have already started thinking about what I will do when I take the week of Christmas off to craft. Make hard tack candy – I love clove candy canes and I can’t find them anywhere out here. I used to make hard tak candy all the time, and this year I am really jonesing for some cinnamon and clove. (Separate, not mixed together). Make a tiny japanese santa Found via Mochimochiland. Hmmm… the link seems to have disappeared now, but I downloaded a free cute santa pattern (yes, I said cute santa) from the website of designer Gera, but it is gone now…. Sorry I can’t share! Work on a vintage crewel pattern How I acquired these is a story for another day. 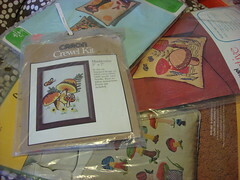 Let’s just say I have several vintage crewel patterns new in the package that I have been dying to try. Spin some fiber It is taking over my apartment and must at least be tamed into yarn. Major gocco project – top secret. Involves so much work it doesn’t really sound fun right now. Take a trip to the East Bay Depot This would likely be counterproductive as I would probably end up with more material or partially completed craft projects, but I haven’t been in so long and I wonder what they have. Not that I promise to stick to your suggestion… but I might! I can’t decide where to start. What do you think? 3 Responses to "Wait, when is Christmas?" you know why you need to go to EBDepot??? 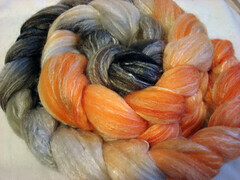 :o) I was also going to by the Cranberry Orange Relish roving on Sat. but i was a few bucks short. any chance you’d be willing to bring that with you? I’ll come prepared this time! ek. That is some gorgeous fiber. I love crewel too. I have a project I need to get started.